I'm back, physically if not yet mentally, and it seems like I missed a fair amount in the Ithaca Journal. Unfortunately their archive only goes back a week, but here's what's happened so far in 2005 2007. The worst story of the year so far, maybe of the year to come, is the alleged stomping and sexual abuse of two three-year-olds off Hanshaw Road. A three-year-old boy is in a Syracuse hospital, while Jacob Carter of Dryden is in the county jail. The sheriff's office apparently has a confession, and the DA is filing charges that could lead to a 75-year sentence. There's another Monitor entry for an assault on a three-year-old, though I don't know if it's related. In much brighter news, the first child of the year at Cayuga Medical Center was born to parents from Varna, and Cathy Wakeman devotes her column to local heroes. Marge Villanova has a photo of the Grand Canyon published. Framing for the new town hall is currently going up and the new home for the Town of Dryden administrative offices should be complete in the fall. The county is working on a study of land use on Routes 13 and 366. Consultants are taking public comments from a previous work session to create two alternatives for development along the corridor, one of which will feature two-node development in Dryden and Varna. These options could be presented to the public in January or February, said Ed Marx, county commissioner of planning. I have my doubts about the 13/366 study, but we'll see what they come up with. Just to the east of Dryden, Greek Peak is working on becoming a year-round destination, which could help local tourism. The County Legislature re-elected Tim Joseph as its Chair and approved a $500,000 loan for RPM, the tree-growing company that's moving to Dryden. Yes, December was incredibly warm. It sounds like January's had quite a start too. In politics, the Journal notes newly-elected State Supreme Court Justice Elizabeth Garry's taking over half the Tompkins County caseload. There's a piece on Michael Arcuri's joining Congress, and a number of pieces on Governor Spitzer. A local views piece includes Dryden School Board President Anderson Young, another examines the prospects for Spitzer's shaking up the legislature (my main reason for supporting him), and another presents State Senator James Seward pretending he agrees with Spitzer while still defending State Senator Joe Bruno, who Seward calls "a great majority leader". On more serious notes, Murray Cohen of Dryden wonders when the world will start pitying the U.S., Julie Owens of Freeville questions the wisdom of bringing back the draft, and Barbara Decker thanks Dryden EMTs for their help. One other note on the Journal - readers seem to have noticed the comments space on their articles, and the comments seem like a free-fire zone to me. Maybe people just had time over the holidays? When Dryden passed a renewable energy law in October, it expressly aimed at small-scale windmills providing power that is mostly consumed on site, rather than large-scale windmills designed to produce power that is fed into the electrical grid. I recently had an opportunity to see the industrial windmills in action, in a variety of sizes. We visited Emmelsbüll, a village in North Friesland, near the Germany-Denmark border. On the train from Hamburg there were lots of windmills, and I was trying to guess their sizes, but when we arrived I could really see them. It turns out that there are multiple sizes of windmill in use, and they're often mixed up within the same project. While the village pastor told me that investors apparently only want to build the 100-meter windmills, which produce the most power, there are lots of smaller windmills still in operation. 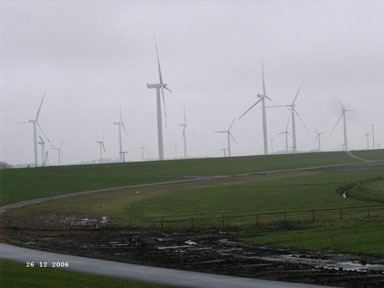 Wind comes off the North Sea nearly constantly, along with rain and fog, and farmers find the windmills a profitable addition to their drenched fields. 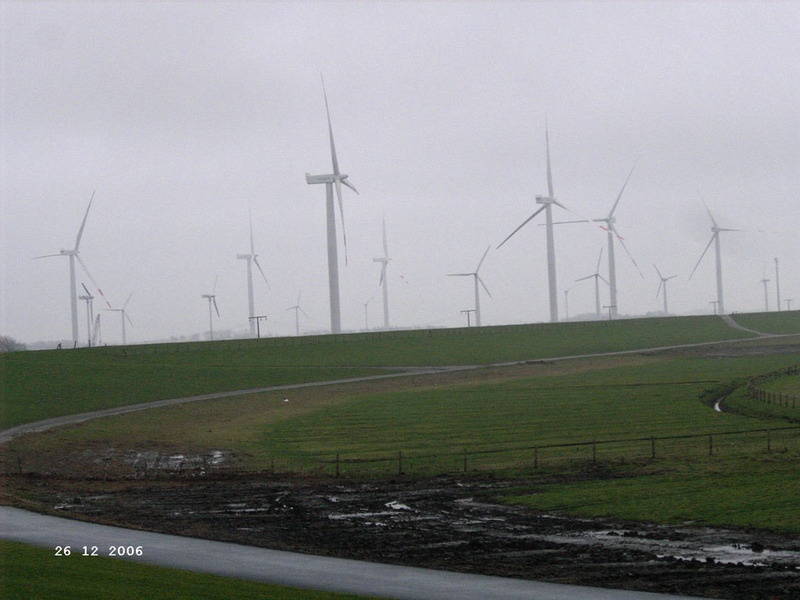 Mostly larger (100m) windmills near the North Sea. 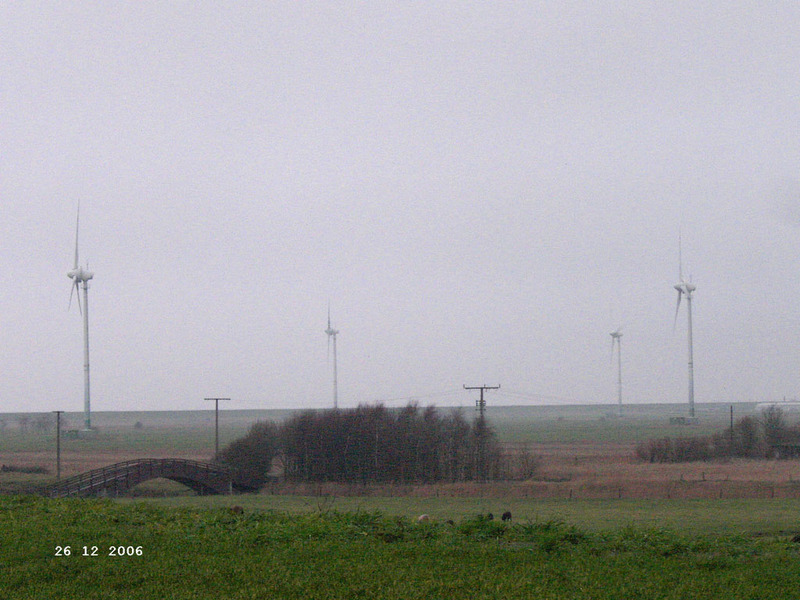 Smaller windmills (~50m) near the North Sea. A range of windmill types near the North Sea. 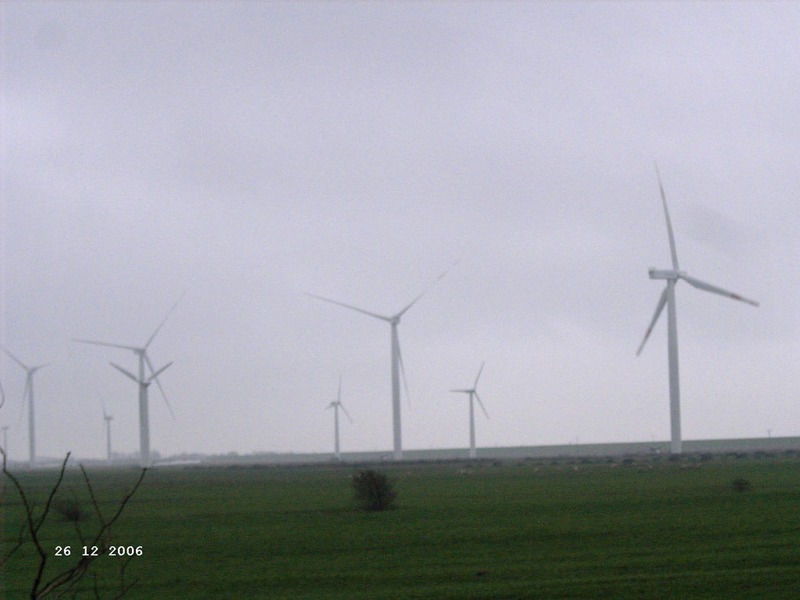 The windmills spun and rotated with the wind, though not all of the larger ones were actually operating yet. The smaller ones were closer to the road, and I could hear some noise, kind of like a washing machine, probably from the turbine. 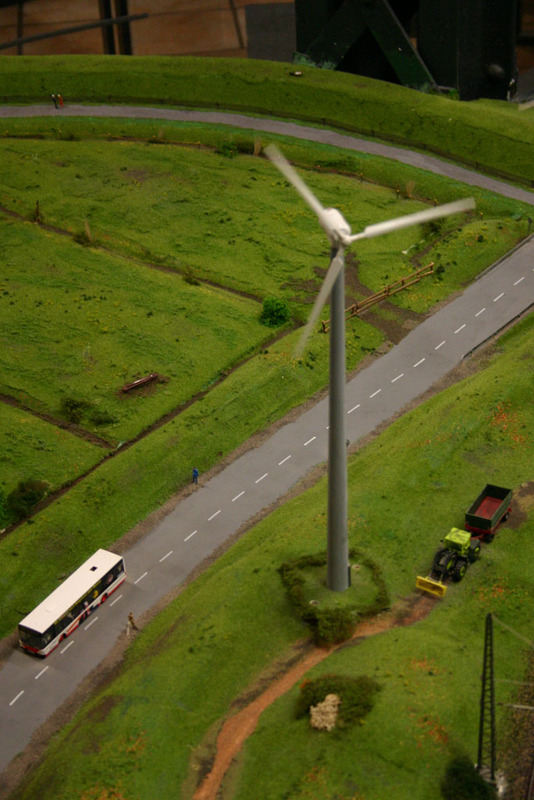 Aesthetically, I have to say that I found the smaller windmills okay - not great, but tolerable - while the newer 100-meter ones loomed ominously and really did look like "schoolbus-on-a-stick". 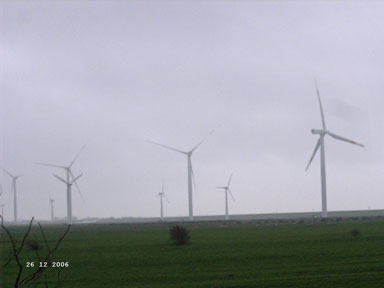 The smaller windmills had shorter, more rounded turbines, and the scale of their construction let them rest more lightly on the landscape. I can't say that I really liked the look of huge numbers of these things. A single windmill can be elegant; dozens of them is definitely cluttered. Overall, seeing these windmills left me in about the same place I'd been before - strongly supporting small-scale windpower, but finding industrial-scale windpower much less exciting. Seeing these things for real left me wondering even more about the wisdom of giant structures needing cranes for repair, and wondering how long it takes to make back the energy cost of building (and maintaining) them. * - If you look closely, you can see that this picture is really from Miniatur Wunderland, an enormous HO-scale model railroad layout in Hamburg. The rest of the pictures are from Emmelsbüll. The pastor I spoke with is Angelika's brother-in-law, and we really went up there to visit her family, not to study windmills. The last two weeks of the Dryden Courier have been pretty quiet, and are pleasantly calming reading after the last week of the Ithaca Journal. Of course, the Courier will probably have to catch up to those stories too. The December 27th issue of the Courier led with an article on the Youth Commission needing new members, esecpially as long-time members Kristen Blackman and Tracey Kurtz are retiring. There's also a picture of the Southworth Library as a gingerbread house on the cover. The inside cover page asks six Dryden Elementary School students about their New Year's Resolutions. Reporter Matt Cooper's column reflects on that resolution story, and there's a picture of playground aide Sue Shaffer wearing reindeer antlers and a nose. In sports, there's an article on Dryden Athletic Director Ralph Boettger's efforts to address athlete behavior problems through community service, and a report on Dryden wrestling's win over Elmira's Thomas Edison High School. 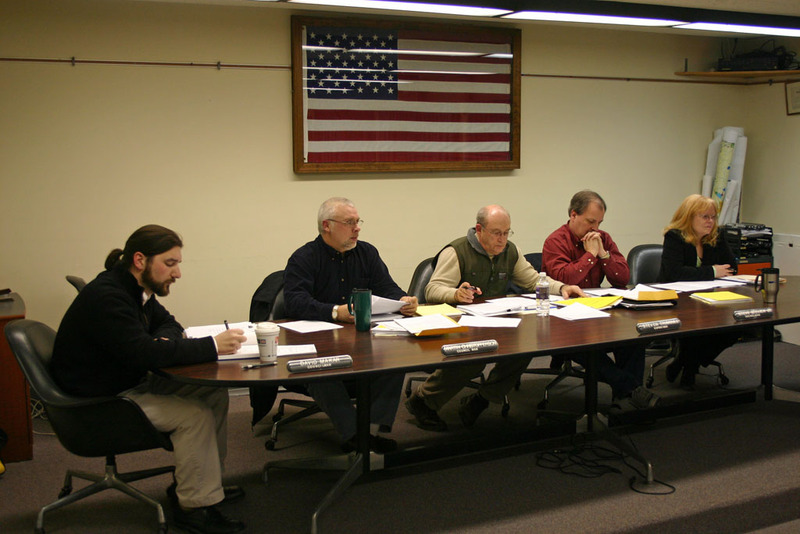 The January 3rd issue leads with a report on the $124,000 the Town of Dryden is spending on monitoring flows in its Cortland Road Sewer District, which connects to the Village of Dryden wastewater treatment plant. Matt Cooper's Inside Dryden column reflects on vandalism and grafitti at the Covenant Love Community Church, with a picture of the damaged sign. He also hopes to finally build a snowman this year. He writes briefly about the Dryden physical education teacher who resigned after an arrest in Cortland for public lewdness, and notes a blog entry on a site about arrested teachers. In sports, there's a report on Dryden Wrestling's loss to Candor, and a 14th place finish at the Windsor Holiday Wrestling Tournament, despite some strong performances by Tony Clarke, Anthony Jerome, and Rex Hollenbeck. This week's issue of Tompkins Weekly features an article on David Makar, the newest member of the Dryden Town Board. Makar emphasizes his intent to represent the entire town of Dryden, his interest in improving Internet and cellular service, his hopes for community centers, and the work he'd like to do bringing new businesses to Dryden. On the front page, there's an article on the County Legislature's re-election of Tim Joseph as its chair, exploring likely projects for the next year. There are also pieces on the Gadabout bus service and leash laws around the county, as well as Ellis Hollow resident Nick Nicastro reviewing Cormac McCarthy's latest novel, The Road . This morning's Ithaca Journal reports that the Dryden Central School District has extra funding available for facilities work, which will allow them to get extra state aid for facilities upgrades without a property tax increase. The Journal now says that December 2006 was only the second-warmest December on record, with 1891 being warmer. It's hard to tell, however, what their clarification about an old weather station being on the roof of a building means. It reads to me like much of that warmth may have come from the building, which isn't a problem at the current Game Farm Road station, but maybe they adjusted the reading? On the opinion page, the Journal's editorial reflects on finding child care after the abuse last week. Dryden residents Art Berkey and Henry Kramer write about their hopes for how a planned Ithaca schools bond resolution will be presented. Nancy Suci of Dryden writes to propose a Martin Luther King Peace Center, honoring the civil rights leader with ongoing work as well as a named place. What's interesting in the case cited here is that the offense of the theft of the meat occurred in the Town of Lansing, the subject was arrested in the Town of Dryden and subsequently arraigned in the Town of Groton. To complicate matters a little more, the individual arrested can face charges in both Lansing and Dryden as the theft took place in Lansing and the possession of the stolen meat occurred in Dryden. Groton was just being nice and helped out with the arraignment. It sounds like Town Courts can help each other out on arraignments within the county, but the actual place the defendant faces charges has to do with where the crime took place. I'm not sure what happened in the end in this case, but this nicely explains some of the flexibility in the system. The Local section of today's Ithaca Journal has photos of the Cornell Law School's mock trials. The online version lacks captions and the accompanying story, but the top photo there is Tompkins County Assistant District Attorney Andrew Bonavia, while the lower photo is Dryden High School students Nick Lange and Lizz Hudler. The state Education Department and the high school may have different numbers on the percentage of students who took the English Language Arts exam, Crawford said. The state mandates a minimum of 95 percent. At Freeville, the K-2 elementary school where the children are too young to take the exams, administrators allegedly did not submit a mandatory report. Ithaca High School and Beverly J. Martin Elementary School were also on the list. There's an update on the three-year-old victim in the Jacob Carter case, who is still listed in critical condition after surgery but doing better. The Monitor reports a Dryden man's arrest for DWI and speeding. In state news, conservative analysts at the Manhattan Institute are all upset over Governor Spitzer's plan to increase the STAR exemption on property taxes, complaining that it's just a shift to income tax. I know they'd prefer to take a chainsaw to state and local government, but the last election demonstrated that not everyone shares that opinion. Moving away from property taxes toward income taxes ensures that taxes are paid by those with the ability to pay them. Those with lots of income may not like that, and that's no doubt why they finance groups like the Manhattan Institute, but it makes a lot more sense. Funds will go to residents who can demonstrate financial need, as determined by Section 8 guidelines. Repairs that qualify for assistance must constitute a violation of code, health or safety standards and could address plumbing, electrical, heating and carpentry issues, among others. The village has already received some applications for assistance. The first applicants could appear before the board starting in March. I missed the Dryden Town Board organizational meeting, so last night was the first time I got to see the newest version of the Board together. Newcomer David Makar joins Marty Christofferson, Steve Trumbull, Steve Stelick, and Mary Ann Sumner on the Dryden Town Board. the decision of what to do with the house near the new Town Hall that the Board bought. Demolish it? Preserve it? The Town has cleared out the building and surrounding area. Part of the barn, in particular, may have historic value. history, as County Historian Carol Kammen came to talk with the Board about a historical brochure for the town and the current lack of a Town Historian. Board member Steve Stelick also talked about having historical displays in the new Town Hall. a growing realization that the work on new zoning, along with related stormwater and riparian buffer zone issues, will be gigantic. (Zoning comes from the comprehensive plan completed last year, while stormwater management and riparian buffer zones are state-mandated projects.) Environmental Planner Dan Kwasnowski will have an incredibly busy year - busy enough, in fact, that the Board agreed to contract with former Environmental Planner Debbie Gross to work on some of the stormwater management project. contemplation of the work involved in supporting Advanced Design Consulting's move to Dryden, which will require major study with participation by multiple agencies. continued discussion of community center funding. A subcommittee of Steve Stelick and David Makar will be working to finish off 2006 funding, sort out 2007, and plan for 2008. One item notable for its brevity was the approval of the 2007 fire contracts, which will go to the fire companies without much change. There is $40,000 in the fire district budget that isn't in the contract which could go to the Etna Fire Company, but the Board will decide that later. There are also questions about matching funds for OSHA gear, training, and physicals, mostly about how these should fit with the contract and how reimbursement should be handled. There were also some questions about monthly reports mandated by the contract. New Emergency Services Committee members Mary Ann Sumner and David Makar will be working to address these questions and plan for 2008. I almost forgot: the Black Sheep Handspinners Guild will be celebrating Rock Day tomorrow at the Varna Community Center (map) from 10:00am to 4:00pm. If you have any interest at all in spinning, it's well worth a visit! he does most photo and music work on a high-speed connection at his business, Ludgate Farms. At home, his only option has been dial-up. Several months ago, when Frontier, his phone company, advertised broadband through the phone line, he promptly ordered it. After Frontier examined the line, he learned it wouldn't work. The article notes that Clarity Connect is working on radio Internet for the area, and there's already a comment on Time-Warner's pickiness in serving Dryden. (I suspect Time-Warner's complaining about the franchise contract is an excuse, as the contract they proposed a while ago doesn't change the status quo in the least, and the Town has practically no say in it anyway.) A companion article looks at Governor Spitzer's hopes for addressing this. There are also updates on two recent crime stories, with the robbery going to the grand jury and the three-year-old victim in the abuse case finally moving from critical to fair condition. Yesterday's Cortland Standard has more on the perpetually delayed New York State Department of Transportation maintenance facility. Back in February 2004 the Village of Dryden annexed land on its northern edge to accomodate plans for the project, which needed to have water available. Now Ron Moore, interim village Superintendent of Public Works, reports that the state will build a salt storage facility there first. A DOT spokesman reports that "design plans for the remainder of the project are 20 percent complete at this time," though the salt shed plans may be at 50%. The state bought the property at the corner of Ellis Drive and Enterprise Drive for $365,000, and has since invested $1 million to extend a water line there. Dryden Mutual Insurance is using that line, at least, but it's not a lot to show for three years. Over the last year, the girls of Troop 869 have painted the playground bleachers at Dryden Elementary School, collected 5,000 cell phone minutes for service people to use from Iraq and organized the purchase of playground toys for the elementary school, which needed to be replaced as a result of the construction of the new playground two summers ago. They're currently focusing on safety, raising money to attend a national sing-along in June, holding a Kid's Night Out on the 26th, preparing for a Valentine's Day flower sale, and planning an event on February 26th for Girl Scout International Thinking Day. In Boy Scout news, Wakeman also reports on Philip Pamel's becoming an Eagle Scout, and the Dryden Barbershop is creating a cookbook of recipes from the men of Dryden. Jennie McGraw-Fiske also gave Southworth Library in the Village of Dryden. In state news, Governor Spitzer and the state legislature have taken a few steps toward budget reform, requiring disclosure of member items in the budget before they are voted in, and sorting out a process for the hard question of "how much money do we really have?" I'm especially glad to see the member items piece, which should help New York move beyond the era of "slushpork", borrowed money under the tight control of the individual legislative leaders and the governor. This morning's Journal is quiet on Dryden, but has an editorial on making broadband more widely available that feels like a followup to Saturday's exploration of the challenges in Caroline and Dryden. This morning's Ithaca Journal reports that the SPCA will be giving free rabies shots on Wednesday at their facility on Hanshaw Road. There's also an article on accusations about NYSEG's business practices, both in their treatment of customers and their treatment of employees. Given their regular back and forth with the Public Service Commission and their bizarre appeals to the public with full-page ads, I'm not entirely surprised. The complete document is online at a Yahoo! forum. I would like it to be known that all of the terrible things that happen are in the Town of Dryden, not the village. Your paper very rarely distinguishes between the two, and the village takes a lot of garbage because of it. Yager is completely right that not nearly enough people make the distinction between the Town and Village of Dryden. The Village is around 1832 people in around 1000 acres fairly close to the eastern edge of the Town, which includes 13,000 people in 94 square miles. You can get a sense of the relationship between Town and Village (and of the many other neighborhoods in the Town) on my Introducing Dryden page. There are times when I really wish the Village had a different name from the Town. People sometimes ask me if I'm going to run against Mayor Taylor, and I have to explain that I live in Dryden, but not in the Village. The Dryden School District includes a majority of the town, but not nearly all of it. Zip codes don't help either. If the Village of Dryden renamed itself, say, the Village of Paradise, there wouldn't be nearly the same confusion. Or the Town could change its name. I don't think either will happen soon. The Town does, of course, include the Village of Dryden (and Freeville). Village residents can vote in town races. Town residents can't vote in Village races, however. The Town and Village also share a court, making the distinction even less clear in criminal proceedings. The Village has police - the Town doesn't - though those police also cover the Village of Freeville (by contract). So Yager is right that it would probably be good to make the distinctions clearer. Unfortunately for the Village, she's definitely not right that "all of the terrible things that happen are in the Town of Dryden, not the village." The recent home invasion was in the Village of Dryden, as was the older daylight robbery of the Song Tao restaurant. The Village police log in the Courier is usually quiet, but it won't always be that way. It would definitely be a good idea to distinguish between the two more frequently, but Yager overstates her case about the Village, from my perspective at least. There isn't much on Dryden in today's Journal, but Craig Cook of Brooktondale writes to say that he hopes "that people will start opening their eyes to the fact that there is a serious problem not only in this area but nationwide with child abuse" instead of "the other politically correct issues this area seems to focus on time and again." Given that last year we elected a District Attorney who pledged to put these crimes at the top of her agenda, it seems possible that the county is already headed that direction. In state news, Jay Gallagher writes of the short honeymoon between Governor Spitzer and State Senate Majority Leader Joseph Bruno. I'm not sure why that's particularly surprising, given that the two of them appear to have nearly opposite views of how government should operate and for who. And apparently whoever becomes the next comptroller has more money to manage than anyone else. I personally believe it is the biggest democratization of the Legislature in all the years that I’ve been there. I guess that a system involving lawmakers bowing and scraping before their leadership for borrowed money is the peak of democracy for some people. Or maybe the system before was even worse? It's hard to imagine, though I suppose it's possible. "secrecy and its fundamental unfairness... The money is doled out really outside of public purview. But on top of that, it’s doled out as a function of political power, not based on need. So yeah, there are some wonderful programs that get funded, but the question is whether or not the system allocates money fairly." The good news is that Governor Spitzer, Majority Leader Bruno, and Speaker Silver scrapped this bizarre system. There will still be member items - but where they belong, in the budget, where they can be part of the larger budget priorities discussion instead of goodies handed out in a dark room by a leadership that already has far too much power. I sure hope that redistricting, forcing political geniuses like these into districts designed around something other incumbents' grasp on power, helps clean up these absurd rituals of power. It'll be too long a time coming, I fear. This morning's Ithaca Journal reports on the creation of the Tompkins County Council of Governments, a new organization including all of the municipalities in Tompkins County - villages, towns, city, county. They "will meet on a monthly basis to discuss and recommend 'non-binding' resolutions for “more efficient and fiscally responsible delivery of government services." Caroline Supervisor Don Barber is the first chair of the organization, which takes an idea from Tioga County and uses it to formalize meetings that had been happening here already. They plan to focus on municipal health insurance costs as a first issue. NYSEG, as a provider of public utility, has a duty to provide gas and electric at the cheapest costs possible that will allow it to stay in business. It has a virtual monopoly on some utility services in the area, and “Voice Your Choice” and other programs designed to end that monopoly are smoke and mirrors at best. For most consumers, it wouldn't have been cost-effective to even try to figure out if it was worth switching providers. It is our expectation that the PSC fully investigates Corbett's claims and at a minimum provides a detailed report that either absolves NYSEG or lets us know what happened. Sometimes when I write this site from the online version of the Journal rather than the print version, I miss a story. Looking at today's copy, it's clear I missed a story, one about someone I know and work with every second Sunday at the Varna Community Center's pancake breakfast: Art Berkey. The Journal profiles Berkey's work assembling boxes at the Brooktondale Food Pantry, but the Ellis Hollow resident also volunteers (with his wife Gladys) at the Varna Community Association, where he's a member of the board. I've seen him regularly at Town Board meetings, patiently talking about issues from community centers to water problems. He's been working Election Day as an inspector for the last couple of years as well. I'm personally lucky to have bought some of the tools he refurbishes, including an axe and a brace and bit. The Journal also notes his sixteen years on the Ithaca City School Board. [Spitzer] also said he will submit “legislation that established an independent, non-partisan redistricting commission” to more fairly draw future election district lines. Spitzer came into Albany claiming that "Day One, everything changes." It was fairly clear to me that unless the legislature changed - it didn't - "Day One" was going to have to last a long time, even as the Governor's office changed. I know too many New Yorkers share Mike's concern about the state of our legislature, but I'm afraid a lot of them seem to think it's impossible ever to change it. Mike's right, though: it's "time to return power to the people of New York." Hopefully we'll hear from our elected officials and the leadership soon, but we also need to be figuring out how to break the dysfunction if those actively participating in it won't do it for us. It's a hard problem, one that requires convincing people their participation will help solve something which makes participation hard. The Dryden schools added $38,000 to renovation plans. The money comes from $200,000 'found' earlier, and the rest of the money will go for "purchasing equipment, textbooks and supplies, and will offset next year's tax burden." Update - Or not: see the comments. This evening's Cortland Standard reports that State Senator Jim Seward, who represents a strangely-shaped district stretching from Dryden to the Hudson River and up to Old Forge, "has been elevated to the No. 2 Republican leadership position in the Senate, where he will serve as majority whip." Seward's press release is pretty brief. I wonder if this gives Seward a shot at becoming Majority Leader if the various scandals around Joe Bruno finally force his resignation, or if it places him too close to the contamination. For the past few days, I've heard occasional crazy howling that I've always taken to be coyotes. I heard it last winter too, though usually the rest of the year is quiet. It's eerie, but otherwise fine - except that it makes my dog bark, which is not quite fun at 2:30am. Ethics changes: How much substance? This morning's Ithaca Journal reports on agreement about ethics reform in Albany in a deal brokered by the classic Three Men In A Room: Governor Spitzer, Senate Majority Leader Joe Bruno, and Assembly Speaker Sheldon Silver. The agreement bans gifts and travel from lobbyists, keeps elected officials out of state-funded TV and radio ads, keeps legislative employees from becoming lobbyists for two years, and keeps the state (except the legislature) from asking about party affiliation during hiring. They also combine the Ethics and Lobbying Commissions. Area Assemblywoman Barbara Lifton says although the reforms are needed, she believes that there are still good people in government. Lifton added that she believes that some of the ethics reforms have some substance, but that some of the reforms seem to be for appearance purposes only. Silver and Bruno will still be calling the legislative shots. All alone. Albany needs a deep fumigation. But it appears to be getting a dusting of roach powder, and nothing else. Spitzer was never a party to what NYU Law School's Brennan Center called the nation's most "dysfunctional" (i.e., corrupt) legislature. But Silver and Bruno are the Legislature. They alone hold all the legislative power. And they alone are responsible for the sleaze and dysfunction. Much as it pains me to agree with the Post, sometimes they're right. This definitely doesn't look like a deep fumigation. An article about County Environmental Management Council members suing the City of Ithaca over the temporary dog park's lack of an environmental review notes Dryden resident Joyce Gerbasi as one of the plaintiffs. This week's issue of The Shopper includes opportunities for Village of Dryden and Town of Dryden residents to get more involved with their community. Village of Dryden residents are invited to caucuses for choosing candidates for the Village of Dryden's March 20th election. Three positions held by Republicans are up for election: Mayor (Reba Taylor) and two Trustee seats (Bob Witty and Randy Sterling). All of these positions are for two-year terms. The Democrats will be meeting in the second floor of Village Hall, 16 South Street, Dryden (map). Please use the side door. The Republicans will be meeting at the Dryden Town Hall, 65 East Main Street, Dryden (map). Caucuses are a "let's get together and choose" kind of meeting rather than the more formal primary approach. To participate in the caucus, you must be a registered voter of the appropriate party for the caucus, and must live in the Village of Dryden. You don't, however, have to be a registered party member of a party to be a candidate - you just have to be a registered voter. Republicans can run Democrats as candidates, Democrats can run Libertarians, and so on. If Village of Dryden politics isn't your speed, the insert from the Dryden Town Historical Society might be of interest. We're looking for members at any level, hoping to celebrate our 25th anniversary year with a burst of growth. I'd strongly encourage anyone interested to visit the History House, which is open Saturdays from 10:00am to 2:00pm, and Tuesdays from 9:00am to 12:30pm. There's great work going on there, and we hope to do more. In light of the recent questioning of NYSEG's ethics toward customers, employees, and regulators, why exactly is Governor Spitzer appointing the president of Energy East Management Corporation, former director of government affairs at NYSEG, to be chairwoman of the state Public Service Commission, which regulates NYSEG? Officials at the Independent Power Producers of New York, Inc., said they applauded Spitzer's selection of Sparks-Beddoe. "Our association and its members look forward to working with Sparks-Beddoe and the PSC to ensure that New York's competitive energy markets continue to serve as a model for the nation," said Gavin Donohue, president and CEO of the Albany-based trade association. Wow. If Voice Your Choice, which the Journal just called "smoke and mirrors at best" is a model for the nation, this country's really in deep trouble. Maybe so is Albany. Of course, maybe Angela Sparks-Beddoe will take all she learned at NYSEG and use it on behalf of the PSC to get us out of this crazy broken system.... I guess I can hope. Gerrard, a lawyer with Arnold & Porter who also has been mentioned for the DEC job, is well-respected in the energy and environmental fields. He has authored works such as "Brownfields Law and Practice: The Cleanup and Redevelopment of Contaminated Land." His latest book is on global warming (a field in which Spitzer wants to make a name for himself). If Gerrard goes to the PSC, it means Energy East lobbyist Angela Sparks-Beddoe would be left out. This morning's Ithaca Journal confuses me a bit. I'm used to Democrats expressing their concerns when someone who's worked for a company with a bad attitude toward regulators is suddenly appointed to be a top regulator. This morning the usual party roles are reversed - it's State Senate Republicans expressing their concern about NYSEG/Energy East lobbyist Angela Sparks-Beddoe, Governor Spitzer's choice to chair the Public Service Commission. "I've known Angela for a long time. She has the necessary skills and she's a hard worker," said Assembly Energy Committee Chairman Paul Tonko, D-Amsterdam, Montgomery County. When asked about NYSEG's clash with the commission, Tonko said, "It's fair to say they responded differently than other utilities to the dismantling of the industry in the Pakaki era. They were bold and she was part of that boldness. This brings a little more balance to the process." The Journal's editorial explores a newly revealed $1.9 billion of "pork projects on steroids," marveling once again at the strange collusion between former Governor Pataki and the legislature on spending money without including the public in the conversation. They hope Governor Spitzer will live up to his word that those days are over. "I think you'll see a much more aggressive and broader use of regulation," Tonko said. "The watchdog has been missing in the equation for a while now." I'll admit to being puzzled why exactly the AARP is actively supporting Sparks-Beddoe as well. Dryden Schools Superintendent Mark Crawford has a letter in today's Journal questioning the state's placing Freeville Elementary School and Dryden High School on their "in need of improvement" list, citing problems in the data collection and interpretation process which had little to do with students' performance. The Journal claims that "an article about this issue can be found on the front page of today's Journal," but I don't see it in the print or online versions of the paper. 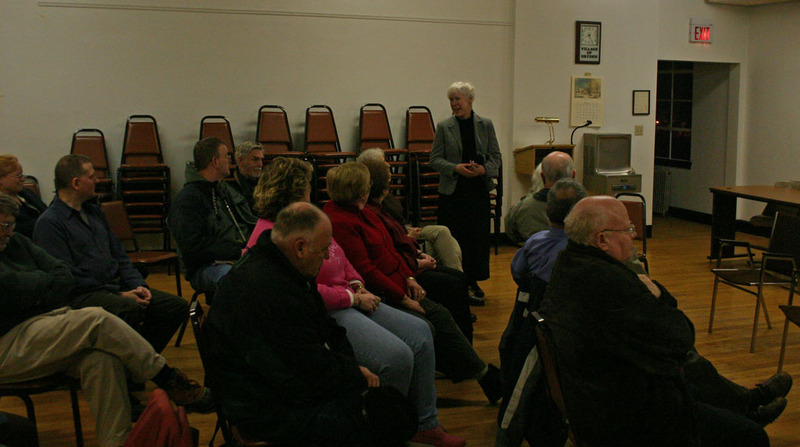 The print version of Local Briefs notes Tuesday's Democratic Caucus for Village of Dryden Democrats. In state news, the governor and legislature look set for fights over healthcare and choosing a new comptroller. I was delighted to get the latest edition of the Etna Volcano newsletter, which announces that "It's Chocolate Time!" The Etna Community Association will be having its 7th annual Chocolate Festival on Saturday, February 10th, from 10:00am to noon at Houtz Hall (map). I strongly recommend going to this event, as it combines delicious dessert with an opportunity to support a community center. I took pictures a couple of years ago, if you'd like some idea of what to expect. A Soup and Salad Supper on Wednesday, April 25th, from 5:30pm to 7:00pm. The Annual Meeting, Tuesday, May 1st at 7:00pm. Playground clean-up day on Sunday, May 6th, with a May 12th rain date. "Happening in the Hamlet" reports on on a meeting Etna had with Fernando DeAragon, direction of the Ithaca Tompkins County Transportation Council on traffic problems, signage, and a possible footpath, and also talks about the Route 13/366 Corridor Management Study meeting. (There's a Pedestrian Traffic Survey in the newletter too.) They applaud the $2000 from the town for playground and park repairs as well as for fixing some holes in their parking lot. They're working to change their charter to a different nonprofit status, and are looking for potential new board members to help them out. This morning's Journal has the article on Dryden schools and the "in need of improvement" list that they'd said would be on the front page of Saturday's paper. It sounds mostly like a complicated data-processing tangle. The Monitor lists a McLean man arrested for identity theft and a Berkshire man arrested for DWI on Route 13 in Dryden. The Journal also takes a look at the cost of board-outs at the county jail, which have increased dramatically over the last year. Board-outs stayed low for a while, but have grown as the number of inmates has grown. On the opinion page, Jay Gallagher looks at the first month of reform in Albany, worried "that many key decisions will continue to be made by Spitzer and legislative leaders meeting behind closed doors." An article on rural revival talks about Newfield, but could apply easily to Dryden. Spitzer would have been wise to wait on appointing Sparks-Beddoe until after the PSC conducts an investigation into Corbett's statements. Corbett also has a lawsuit pending that could tarnish Energy East and NYSEG further, or absolve them in some fashion. All is not lost with this appointment. Spitzer should immediately withdraw Sparks-Beddoe and move in a different direction or wait to see what the PSC does with Corbett's allegations. Further, we wonder how he can be comfortable tapping the head of a company that "waged a public war" with the PSC. Those paint chips on the Spitzer Humvee are small right now. Pull Sparks-Beddoe's name and the governor's reform machine will only need a small touch up. If Spitzer leaves things where they are, we could be heading straight to the body shop for some major reconstruction. Okay, the Humvee analogy is pretty strained, but it's really hard to see at this point how this appointment can possibly demonstrate good judgment. Maybe we'll get to hear of Sparks-Beddoe's mighty efforts to contain NYSEG's bad ideas from within, or of her plans to build up the PSC so that a "bad-boy poster child" has no advantage. So far, though, the story looks pretty unpromising. Update: The Binghamton Press & Sun-Bulletin editorial shares similar concerns. (Hmmm... kentwater at the Binghamton paper and Greater_Ithaca on the Journal site posted identical comments on the two editorials. Odd.) There's also a letter in the Binghamton paper. I was just on WHCU 870 talking about tonight's Village of Dryden caucuses. Here's a recap. Democrats will be meeting in the second floor of Village Hall, 16 South Street, Dryden (map). Please use the side door. Republicans will be meeting at the Dryden Town Hall, 65 East Main Street, Dryden (map). It's a great way to see local politics at work, and I strongly encourage Village residents to attend. The Dryden Democrats started the race for village offices with a bang: great turnout at a caucus that unanimously nominated two strong candidates for Village Trustee: Lisa Valentinelli and Elizabeth Gutchess. Lisa Valentinelli is the principal of the MacCormick Secure Center in Caroline. She grew up in Dryden, and as she puts it, "she's always come back to Dryden." She'll be starting work on her doctorate in the fall. She wants to see open government, and wants to see better communications within the village. Neighbors should know what's going on, and know each other. She's looking forward to asking questions. 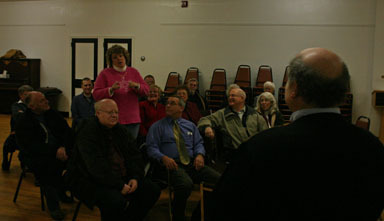 Lisa Valentinelli (standing) introduces herself to the Dryden Democrats. Elizabeth Gutchess has taught English at TC3 for the past 16 years and lives on East Main Street. She recently published the first volume of her history of the Village's second century. She volunteers at the Dryden Presbyterian Church's Food Pantry. She's the advisor to the TC3 drama club, where she's been trying to connect TC3 with local residents more directly. She'd like to develop stronger connections between TC3 and the Village. 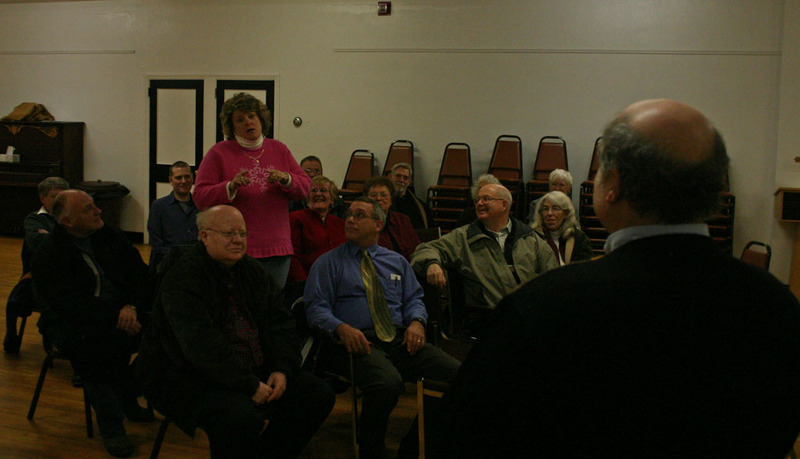 Elizabeth Gutchess introduces herself to the Dryden Democrats. Mayor Reba Taylor reports on WHCU that Republican incumbents Bob Witty (CFCU president) and Randy Sterling (a City of Ithaca police officer) will be running for trustee, and she will be running for Mayor. This morning's Ithaca Journal reports that it looks like the Cayuga Nordic Ski Club's Snowfest on Hammond Hill will have plenty of snow and fun. It will be Sunday, February 4th, from 10:30am to 3:00pm at Hammond Hill State Park, based around the parking lot on Hammond Hill Road. They'll have equipment available to borrow starting at 10:00am, and plenty of activities for young and old alike, as well as a heated ski hut with free refreshments. Cathy Wakeman's Dryden Town Talk covers other activities for beating the winter blues, especially for the elderly. She also visits the Dryden Dollies (the local Red Hat Society chapter), a Cub Scout Pinewood Derby, and announces an a capella concert coming up next Friday, February 9th. Ever wonder what the TC3 dorms look like on the inside? The Journal visits the newest one, with a detailed description and pictures.